Hold onto your wallets ... many insurers want to substantially hike rates on Obamacare policies for 2016. Many are proposing double-digit premium increases for individual policies, with some companies looking to boost rates more than 60%, according to a list posted Monday by the federal Centers for Medicare & Medicaid Services. In Florida, for instance, United Healthcare (UNH) wants to raise the rates of plans sold on the Obamacare exchange by an average of 18%. Individual policies available outside the exchange through United Healthcare or through a broker would go up by 31%, on average, with hikes as high as 60% for certain plans in certain locations. 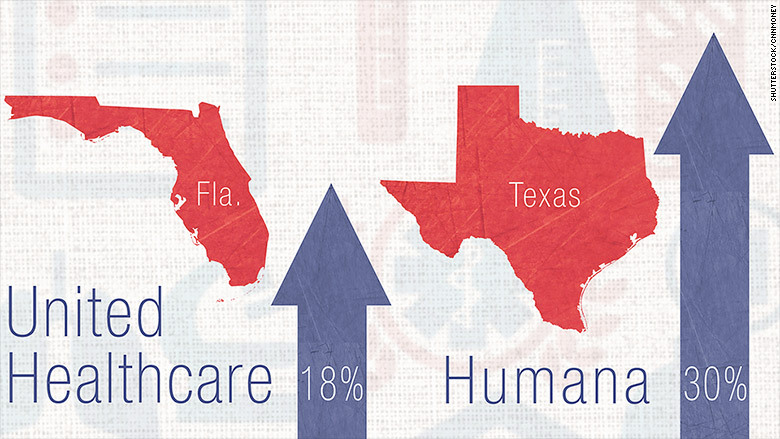 In Texas, insurer Scott & White is looking for a 32% increase for exchange-based plans, while Humana (HUM) is asking for an average 30% boost for its exclusive provider organization policies, which generally cover only in-network services. Insurers say they want to hike rates because enrollees are going to the doctor, getting lab work and filling prescriptions more than they had originally anticipated. "We've seen a great pent-up demand for services," said Aaron Billger, spokesman for Highmark, a Blue Cross Blue Shield licensee offering plans in Pennsylvania, Delaware and West Virginia. Enrollees in Obamacare exchange plans use more healthcare than those in job-based policies, he noted. Insurers submitted their proposed rate hikes for individual policies sold both on and off Obamacare exchanges for review by state officials. The government's list includes insurers that requested increases of 10% or more. Insurers can opt to offer plans on the exchanges, directly or via both methods, but policies with similar coverage must be priced the same. Rates for Obamacare plans have been closely watched -- and their affordability hotly debated -- since the exchanges first opened in 2014. Insurers had a tough time setting rates in the first two years because they didn't have a lot of data on how much customers would visit the doctor. Now they can base their prices on actual usage, said David Axene, fellow at the Society of Actuaries, an industry group. Some insurers may have underestimated and set their prices too low in 2014 and 2015. Blue Cross and Blue Shield of North Carolina cited hospital in-patient care, particularly cancer and heart conditions, emergency room visits and specialty drugs as major contributors to its proposed 26% hike. Insurers, however, probably won't be granted all that they seek. Insurance commissioners in 36 states have the power to deny the rate requests, though they usually negotiate smaller hikes with insurers. Also, the requested rate changes for 2016 can vary widely based on the specific plan. United Healthcare, for instance, noted it's only asking for a 1.2% increase on some of its plans. This reinforces the need for consumers to shop around when open enrollment begins in November and not just renew their existing plan. While the proposed rate hikes seem steep, they won't hit Obamacare enrollees as hard since most receive federal subsidies. But even subsidized enrollees will have to pay more depending on the plan they select. Those signing up for individual coverage outside an exchange will pay full freight since they aren't eligible for subsidies. Rates will be finalized in coming weeks, but consumers may not learn the final prices until just before enrollment opens.